Chukwuemeka George Dike, author of the modern Lagos-based thriller The Inverted Pyramid, has set his new fiction, African Tales of a Green Planet, in the Niger Delta area of Nigeria roughly between 1730-1850. The time, place and publication date are symbolic for a number of reasons. 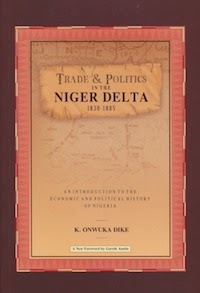 Emeka Dike's story grew out of his father’s book, Trade and Politics in the Niger Delta 1830-1885: An Introduction to the Economic and Political History of Nigeria, published before Emeka was born. Kenneth Onwuka Dike's Trade and Politics grew out of his 1950 thesis for a doctorate degree at Kings College London, and first published in Britain in 1956. In the foreword of the 2011 Bookcraft Africa publication, Gareth Austin, at the London School of Economics, saw Trade and Politics not only "as an inspiration for the broad field of West African and African history, and as a pioneering contribution to the presentation of West Africans’ perspective on their history," Austin also saw the academic book "as an entry into the rewards of studying West African history." 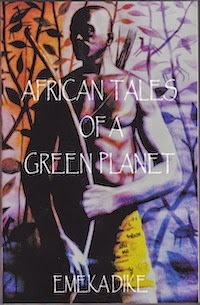 As a reader, I found the rewards not just in the scholarly classic of Dike Sr. but in his son's risky and challenging interpretation in African Tales of a Green Planet. Reading both books back to back was like reading a two-volume set on the history of the Niger Delta. 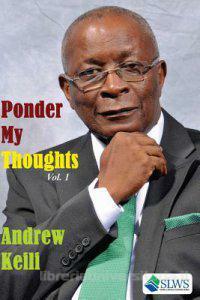 The "pioneering work" by Professor Dike was truly made "fresh" and given "stimulating perspective" in African Tales. 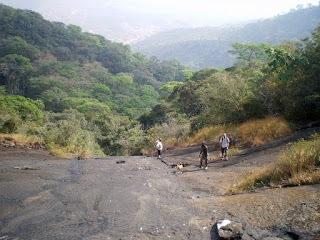 Be prepared to be struck by not just by juxtapositions of environmental issues now and then, but also by how 18th century West African beliefs, cultures, folk tales, and power politics still trouble 21st century Nigeria. Chukwuemeka George Dike, was born and raised in Ibadan before leaving for boarding school in England and much later, university in America. He is managing director of an equity & research firm and is married. The couple are blessed with seven children. Since 1985, he has run The Kenneth Onwuka Dike Center, which he describes as a center for African history that is dedicated to building up a data base for historical sources in African history. In 2011, when he first interviewed with Vitabu he was working on republishing Trade and Politics in the Niger Delta 1830-1885. 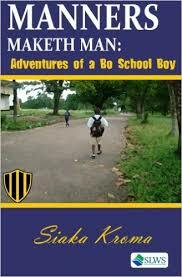 The classic was written by his late father Professor Kenneth Onwuka Dike. The elder Dike attended Fourah Bay College in the 1940's.